Stone said he stopped participating in second grade after seeing his father, who works in the Pontiac school district, sit during the pledge. 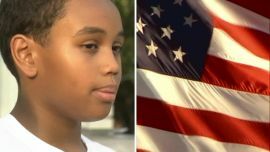 Detroit-area teacher was put on leave after an 11-year-old boy said he was physically pushed out his chair to stand during the Pledge of Allegiance. Stone Chaney, 11, a sixth-grader at East Middle School in Farmington Hills, said he makes a pledge to God and family - not a flag – and has skipped participation since second grade. "God said don't worship anything other than me, don't worship any idols, and pledging to a flag would kind of be like worshiping it," Stone told Fox 2 Detroit. "It's not if I have a reason or not, it's my right." Stone said he was doing homework during the pledge on Sept. 7 when a teacher “snatched” him out of his chair. "A teacher just comes up, puts her arms under my armpits and snatches me out of my chair. I say I don't stand for the pledge, she just glares at me and walks away," Stone said. "I just feel like my rights were violated. And she was the teacher consultant; the person who teaches other people not to put their hands on students. So who knows what other teachers she's taught her way of thinking." Stone said another teacher the next day yelled at him to stand up. Stone’s parents demanded the teachers be reprimanded for their actions at a school board meeting. Farmington Public Schools Superintendent George Heitsch said one teacher has been placed on leave while the district investigates. He said students have the right to skip the Pledge of Allegiance. The district expects every child and adult "to be treated with dignity and respect," Heitsch said. Phillina Mullin, Stone’s mother, said the educator should not have touched Stone. "One of the main issues we're having a problem with is the fact that an adult felt the need to put their hands on my child,” Mullin told Fox 2 Detroit. Stone told Fox 2 Detroit he hoped his story would catch the attention of former San Francisco 49ers quarterback Colin Kaepernick who made headlines last year for sitting during the national anthem before an NFL game to protest police brutality. Kaepernick has remained unsigned after opting out of his contract with the 49ers. Stone said he stopped participating in second grade after seeing his father, who works in the Pontiac school district, sit during the pledge. Brian Chaney praised his son's ability to walk to his "own beat." "I'm looking at my son as a hero. He believes in what he believes in," Chaney said. "He's not worried about what other people think of him." Stone said he was concerned about his three younger brothers and hopes they do not face the same treatment. "I have three younger brothers and hope it never happens to them, nobody in East (middle school). Nobody in Michigan, nobody all over the country," Stone said.